As the Tiger incident unfolds in Ranthambhore many effects of a system failure particularly with regard to the forest officials are coming to the forefront. The Bhuriphadi village which has generally not been hostile towards the forest in the past was already hostile in terms of an earlier incident where some money had changed hands and no receipts were provided. Under these circumstances Daulat Singh was sent to tranquilise this male Tiger that had already been suffering under heavy human disturbance. 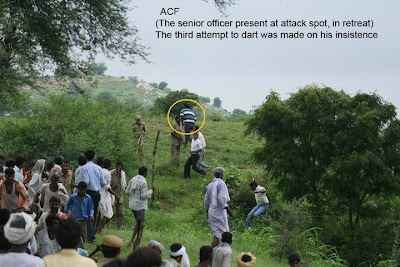 He was lucky to have had a committed Police Force with him that had little experience of Tiger control but were there to prevent any untoward incident between village and forest officials. This police force was already exhausted due to two days of Municipal election duty but still managed to be there and do the best they could. There was no officer from the Forest Department guiding the police force in any manner and they were left to be mere spectators with no instruction. However they still tried their best to control the mobs. They even tried to convince Daulat Singh to not go and try to tanquilise the Tiger the 2rd time as it was dangerous. Daulat was convinced and tried to tell his immediate superior Mr Sedu Ram Yadav that no more effort to tranquilise should be done as it was dangerous. However Sedu Ram was communicating with his superiors over the wireless and insisted that a 3rd attempt be made. It was against the back drop of this complete lack of understanding of the situation on behalf of the superior officers that Daulat took the risk to make a 3rd attempt. This situation is further compounded by the fact that as soon as Daulat was gravely injured the 1st person to leave the scene of incident was Mr Yadav and behind him disappeared most of the forest officials. It was the police that took stock of things and got Daulat out of the area and sent him to the Hospital. Not only did they do this but they kept a vigil on the Tiger keeping people away from the scene through the night and until the next day when the Tiger has left and gone back into the safety of the Park. During this entire period no forest official or staff stayed at the scene to watch the Tiger. Had the police not been there the villagers would have definitely killed the Tiger and if not that then the Tiger would have killed some of them. Time and time again it has been seen that in crucial wildlife management crisis the top official in the Forest Department fail to provide a measured and experienced response. There is no standard operating protocol for such incidents and every action taken is a knee jerk reaction made on the spur of the moment causing needless injury to man and animal. Thanks for the news, Divya. You are very true Divya I totally agree with there no proper protocol to handle to such situations govt (forest officials) must do. Great Live Story.Amazing Pics.My compliments to Bravo Dharmendra and Divya for writing so well and bringing truth to the surface. 1. Whether Govt. officials are well trained to handle situation like these kinds of rescue operations? 2. Whether officials involved in rescue operations were well equipped with helmet, first aid kits, dressed and trained to handle tranquillizer gun? 3. Whether officials knows well about dose and are there any Vet. in rescue team? 4. Whether ambulance service were provided to the rescue team? 5. What measures taken by rescue team to keep public away during operation? 6. Who protect the officials? If officials protected by the public then why they were booked under Sections 353, 332, 816 of IPC and Section 3/51 of the Forest Act, where as officials failed to perform their duties? Thanks Divya for all your balanced reporting on this unfortunate incident.We can only despair that the FD is so arrogant & inept. Well this is really beyond my comprehension as to how a senior officer wasn't present at the site when such an important and risky job was being done.A single ACF is clearly not enough to manage such a serious affair. And add to that the ridiculous FIR charges by the Department on Mr. Dharmendra Khandal who reported the completely haphazard "tranquilizing operation". It is extremely disappointing to know that this is the ridiculous state of affairs in a premier Tiger Reserve like Ranthambore.